Let's say you step in a puddle and it soaks right through your shoe. Are you just supposed to go all day with a frigid, damp sock on your foot? 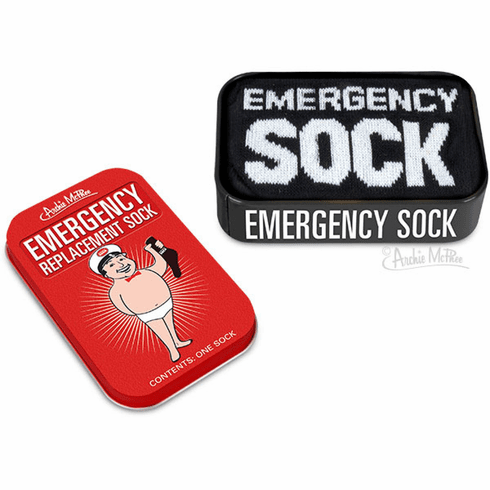 This Emergency Replacement Sock comes in a 3-3/4" x 2-1/2" x 1" (9.5 cm x 6.4 cm x 2.5 cm) tin. The tin contains one (1) solitary cotton/poly blend sock that is clearly marked EMERGENCY SOCK. Having it clearly labelled is important because it lets everyone around you know not to judge your fashion choice; this is an EMERGENCY! Also good for dryer disasters and sock thieves. Sock is one size fits most. 12 shrink wrapped tins in each illustrated display box.